Posted on June 11, 2018 by admin in - WOW! It’s no secret, Shepard Fairey has always been open about controversial social and political topics, as evidenced in his artwork which promotes awareness of social issues. His aim in his work is to reawaken a sense of wonder about one’s environment. However, something very interesting about this work, that many may not notice until pointed out is the influence of another social and political activist artist. Fairey’s Sedation Pill could have been crafted 50 years ago by famed Pop artist Robert Indiana. 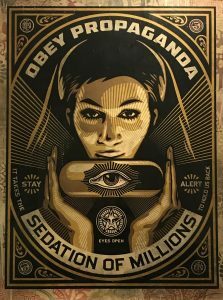 Using words like Stay Alert and Eyes Open as imagery to effectively convey his message, and of course the title of the work “It takes the sedation of millions to hold us back”. Fairey, creatively taking a page from Indiana’s playbook, not only uses words, but also positions them along side of geometric forms and shapes, and effective fonts to emphasize not only the word but its connotations. Indiana brilliantly understood that words would not be enough. He had to pair them with form, shape, color, and draw the viewer in by making the work visually optical, and kinetic. Shepard Fairey did all this with Sedation Pill. 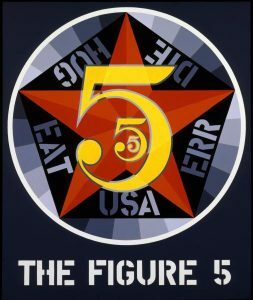 If the influence of Robert Indiana is not obvious to the viewer just on the merits of the work itself, well then Fairey let us know by adding the number 5 at the top right and bottom left of the work. 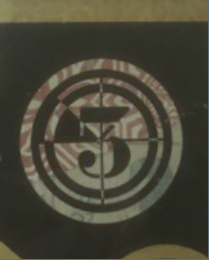 In 1963, Indiana paintied “The Figure 5”, owned by the National Museum of American Art, Smithsonian Institution, in Washington D.C.
Sedation Pill HPM is a Hand Painted Multiple. This means that the entire paper that the work is printed on is all made of collaged elements of newspaper, torn stenciled patterns on paper, that Fairey is so well known for. Once the collaged paper is created, the image is then silkscreened on top of the paper. The torn elements of paper create a raw or rough look, as if this work was pasted on a wall on top of other previous works that had been there and have a worn or weathered look. After the silkscreen is placed on top Fairey then goes back and hand paints on top of the silkscreen, and margins. Posted on October 9, 2017 by admin in - WOW! Rubik’s Cubes are meant to be solved, right? Wrong!! The art of cubing takes on a different meaning under the 8-bit eyes of Invader. Twisting dozens, even hundreds of Rubik’s Cubes into precise patterns of pixelated pointillism, Invader updates artistic techniques pioneered by Picasso, Duchamp, Seurat and others into a new and distinctly modern form: Rubikcubism. Billed as the “Urban Seurat”, Invader is the pseudonym of a French urban artist, born in 1969, whose work is modeled on the crude pixellation of 1970s–1980s 8-bit video games. A graduate of the École des Beaux-Arts in Paris, Invader initially derived inspiration for his creations from video games from the late 1970s to early 1980s that he played when he was growing up, particularly characters from Space Invaders, from which he derived his name. Games of the era were made with 8-bit graphics, and so lend themselves well to his method of each tile representing one pixel. 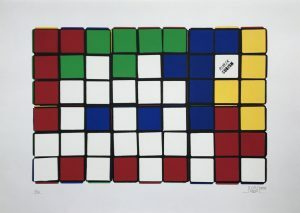 One of Invader’s most important innovations was Rubikcubism, a style of mosaic art that uses various Rubik’s Cube configurations to create extremely complex images. While most try to solve the Rubik’s Cube, anonymous French Street-Artist, Space Invader has come up with another creative use for the toy. Since 2004, he has been using Rubik’s Cubes to create crude-pixelated pointillism artwork. Updating and modernizing a technique pioneered by Georges Seurat and Paul Signac, Invader named the movement: Rubikcubism, and has continued to experiment with the style ever since. This week’s Work of the Week! (WOW!) is Invader’s Rubik Six Cube Series. These screenprints are made up of 6 cubes, all arranged in a specific manner to create an image. In the case of this series, Invader’s trademark Space-Invader, his most iconic image of the 80’s is portrayed. Coming of age in the 80’s, much of Invader’s artistic identity revolves around the iconic imagery and pop culture of his youth. 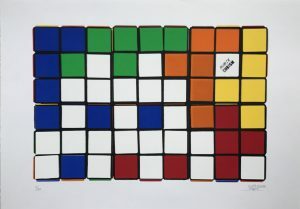 Given the difficulty of solving a Rubik Cube, let alone attempting to create images, Invader uses a computer program to work out the precise disposition of the six colors for each image. He then manipulates the nine pixels for each Rubik’s Cube to give the required pattern. While this series is made up of the use of six cubes, some of Invader’s creations can use over 300 Cubes. He has recreated “Masterpieces” where famous paintings by artists such as Delacroix, Warhol, Seurat, and Lichtenstein are given a work over. He has a series of Rubikcubism works entitled “Low Fidelity” based on iconic album art such as “Country Life” by Roxy Music, and The Velvet Underground & Nico. He has also created a series of “Bad Men” where Invader reinterprets villains such as Osama bin Laden, Jaws and Al Capone. All these works and themes are relative to pop culture, and to today’s world in which we live in, with a touch of nostalgia from his days as a youth. What does Erno Rubik, the inventor of the Rubik’s Cube have to say about Invader’s use of his famous toy puzzle in his artworks? Posted on May 15, 2017 by admin in - WOW! 9 7/8 x 11 7/8 in. Invader is the pseudonym of a French urban artist, born in 1969, whose work is modeled on the crude pixellation of 1970s–1980s 8-bit video games. He took his name from the 1978 arcade game Space Invaders, and much of his work is composed of square ceramic tiles inspired by video game characters. Although he prefers to remain incognito, and guards his identity carefully, his distinctive creations can be seen in many highly-visible locations in more than 75 cities in 33 countries. He documents each intervention in a city as an “Invasion”, and has published books and maps of the location of each of his street mosaics. Invader likes tiles for their robustness and permanence. Video games of the era were constructed with 8-bit graphics, and so it lends themselves well to the mosaic treatment, with each tile representing one pixel. Invader’s idea is to bring the virtual world into reality. He sees himself as a hacker of public space, spreading a virus of mosaics;[the streets are his canvas, his invasions are gifts to the city and its people. One can see many things in it, but it refers to the early days of digital and the video game. His first mosaic was installed in the mid 1990s in his home city. It was a sleeper for several years before the full “invasion” program was conceived in 1996. This was the first wave of the “invasion”. By 1998, it had spread to 31 other cities in France. Today, 77 cities have been invaded, 2,692 Space Invaders placed comprising some 1.5 million ceramic tiles; 19 invasion maps have been published. He has invaded New York five times, Miami twice, and Hong Kong on three separate occasions. This week’s Work of the Week (WOW) is called Hypnosis. 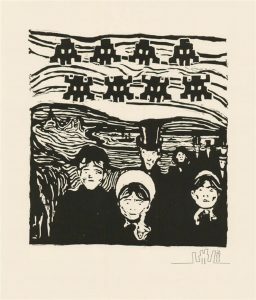 In this work, Invader channels the work of the Norwegian painter and printmaker, Edvard Munch. Munch was greatly influenced by the German Expressionists in the early 20th century. Many artist in this genre used the woodblock process in print form, to capture the angst of the times. Hypnosis is a woodblock print done is Munch’s German Expressionist style. Here we see Munch’s typical figure and his familiar wavy lined background. The work is very dark, as is the work of the German Expressionists. We see the effects of war through the eyes of these artists. Here is where Invader starts to have fun with this work. He uses the dark, depressed like image of Munch’s work, and inputs his space invader figures making this work fun. However, upon further examination, we see the play on the idea that the space invaders are invading these villagers or the village. This is, and has always been his concept, THE INVASION. This is a great example of an extreme and obvious invasion. Posted on May 1, 2017 by admin in - WOW! Music has always had a huge influence on pop culture. Every generation had a defining genre of music. Music, like art speaks volumes about the times in which we live in. Just as art, music is constantly changing. Shepard Fairey’s brand of art is Street Art. Real street art touches upon the pulse of the everyday person, whose perception of what art is about is not in a museum, but rather on the street. Music touches the everyday person, much like the street art of Shepard Fairey and his contemporaries. Society emulates musicians, society hums their music, society sings their lyrics. Fairey’s art is an extension of what music does to society. His work talks about the social, environmental, political, and every day issues that concern the everyday person. His work became more widely known in the 2008 U.S. presidential election, specifically his Barack Obama “Hope” poster. The New Yorker art critic Peter Schjeldahl called the poster “the most efficacious American political illustration since ‘Uncle Sam Wants You‘”. 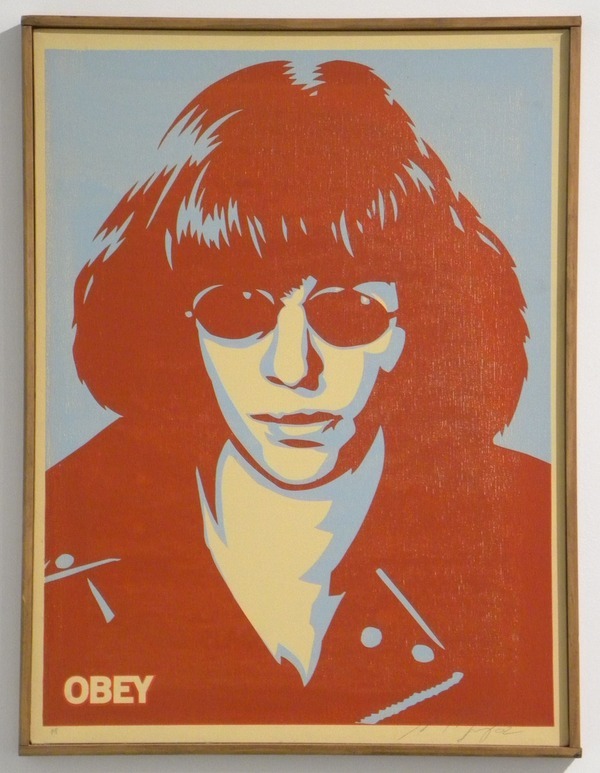 This week’s Work Of the Week (WOW) is a very rare silkscreen on canvas of one of Shepard Fairey’s favorite Punk Rock icons, Joey Ramone. The Ramone Canvas as it has come to be known, was done in 2002. There are only 2 of these pieces ever made, plus 1 AP (artist’s proof) and 1 PP (printer’s proof). Needless to say, this work is extremely rare. In 2002 – 2003 Fairey produced a Punk Pioneers suite. The first piece of this series was Joey Ramone, lead singer of the Ramones. Despite others that had come before him setting the stage for the punk rock genre, such as Iggy Pop or the Stooges, the Ramones, according to Fairey “really set the wheels in motion” in the realm of punk music. The other icons in Punk Pioneers suite are Johnny Rotten, Joe Strummer, Glenn Danzig, Henry Rollins, and Ian MacKaye. However, the only work on canvas was of Joey Ramone. All the other icons were silkscreen on paper and in an edition of 300. The whereabouts of the 2 editioned Ramone Canvas are unknown. The printer’s proof has been found, and archived, but has a tear to the canvas. Thus, leaving the Artist’s Proof left, which belongs to Gregg Shienbaum Fine Art, the only known work in mint condition. Posted on April 17, 2017 by admin in - WOW! Banksy is a British street artist and activist who, despite worldwide fame, has maintained anonymity. Although details of the artist’s life are largely unknown, it is thought that Banksy was born in Bristol more or less around 1974, and started his career in this city as a graffiti artist. Whether plastering cities with his trademark gangsta rat, painting imagined openings and building hotels in the West Bank barrier in Israel, or stenciling “we’re bored of fish” above a penguins’ zoo enclosure, Banksy creates street art with an irreverent wit and an international reputation that precedes his anonymous identity. “TV has made going to the theatre seem pointless, photography has pretty much killed painting” he says, “but graffiti has remained gloriously unspoilt by progress”. Banksy’s work features striking and humorous images, occasionally combined with slogans. The message is usually anti-war, anti-capitalist or anti-establishment. Subjects often include rats, apes, policemen, soldiers, children, and the elderly. As all Banksy fans know, the artist can be extremely edgy, political, satirical, and in the case of this Work Of the Week, Grannies, humorous as well. 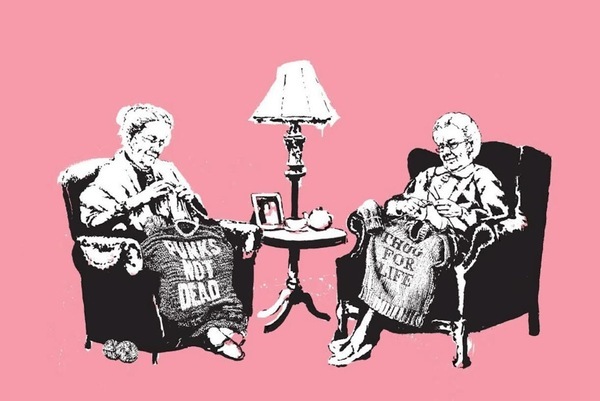 A humor that plays upon the evident contrast and contradiction that lays in the image of two old, extremely British ladies knitting sweaters that say PUNK IS NOT DEAD or THUG FOR LIFE. Banksy’s works need no explanation. 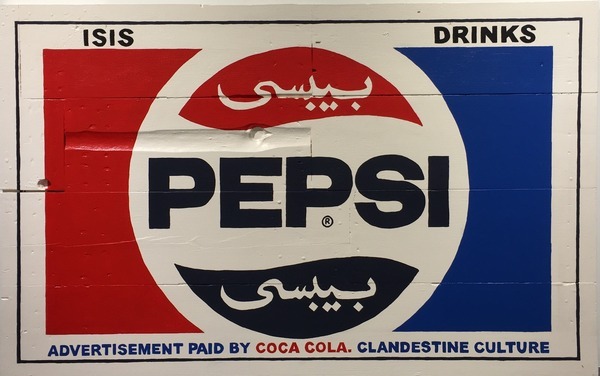 Through his crafted signature and his immediately identifiable graphic style, he critically examines contemporary issues of consumerism, political authority, terrorism, and the status of art and its display. Grannies is another perfect example of how Banksy’s work can be thought-provoking, intense, shocking, intriguing and funny. Posted on February 13, 2017 by admin in - WOW! This must be sold as a set of 4 only. Keith Haring was born on May 4, 1958 in Reading, Pennsylvania. He started developing a love for drawing at a very early age, learning basic cartooning skills from his father and from the popular culture around him, such as Dr. Seuss and Walt Disney. Upon graduation from high school, Haring moved to New York City and enrolled in the School of Visual Arts. In New York, Haring found a thriving alternative art community that was developing outside the gallery and museum system, in the downtown streets, the subways, the clubs and former dance halls. Here he became friends with fellow artists Kenny Scharf and Jean-Michel Basquiat, as well as other musicians, performance artists and graffiti writers, all together forming the New York art community. Haring was swept up in the energy and spirit of this scene and began to organize and participate in exhibitions and performances at Club 57 and other alternative venues. 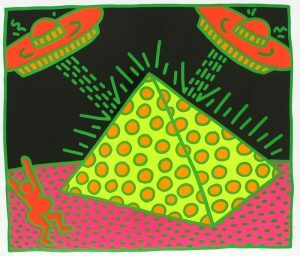 Though many associate the artist Keith Haring with his seemingly innocuous images of barking dogs, crawling babies, beating hearts and flying saucers, his work often tackled social justice issues – from nuclear proliferation, to AIDS, to the environment to racial and income inequality. In April 1986, Haring opened his first Pop Shop, a retail store in Soho selling T-shirts, toys, posters, buttons and magnets bearing his images. Haring considered the shop to be an extension of his work, intended to allow people greater access to his work, at a lower cost. The shop received criticism from many in the art world, however Haring remained committed to his desire to make his artwork available to an audience as wide as possible, and received strong support for his project from friends, fans and mentors, including Andy Warhol. This is the origin of the Pop Shop series, that at the time could be acquired for what could be considered an affordable price back then, and that now are one of his most iconic and recognized works. Pop Shop prints were released as a set of four individual pieces or one quad of the different images. This work of the week is called Pop Shop II, a set of four individual works, all pencil signed and all matching numbers. 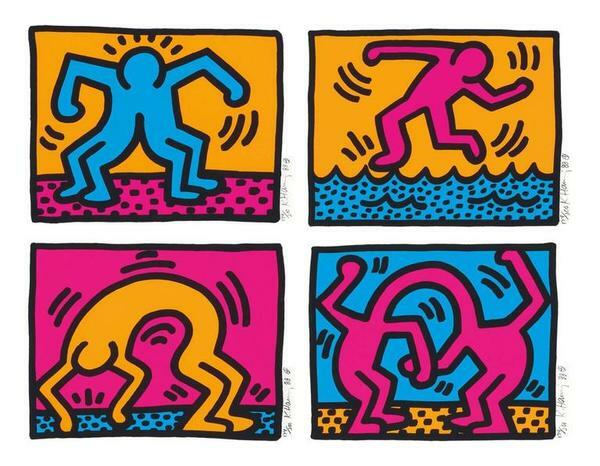 Haring was a child of Pop. In his Pop Shops, he used his iconic symbols and characters in a playful and joyful way, with bright colors and bold contours of cartoonish figures. While his human figures generally depict people and players in society, human figures depicted upside-down, like the one in Pop Shop II, are usually B-boys and B-girls, the dancers of hip-hop, doing the iconic move in which they spin on their head. Figures contorting in backbends or jumps are also depictions of break dancers, some of the most iconic cultural figures of the New York City of the 1980’s. In the Pop Shops, Keith Haring always kept imagery accessible and easy to understand, in order to grab the eyes and minds of viewers and get them both to enjoy themselves and to engage with important concerns. Haring’s genius was his ability to communicate very directly, very immediately through his chosen symbols and iconography. The joyfulness and a wonderful lightheartedness in his work, is a message of his vision and strong hope of a better world to come. Posted on January 30, 2017 by admin in - WOW! This work presents Ahol Sniffs Glue’s famous lovable characters in a completely different light than what we are used to. For a very long time Ahol has been working in a completely different style and medium, but was never fully confident in showing that work. Not because the style was not good, or the work was not of the highest caliber, but because for as long as he can remember, his artistic career was built upon a certain style, that everyone has known and loved for so long. This is a drastic change in style that, the artist feels, “feeds his soul”. 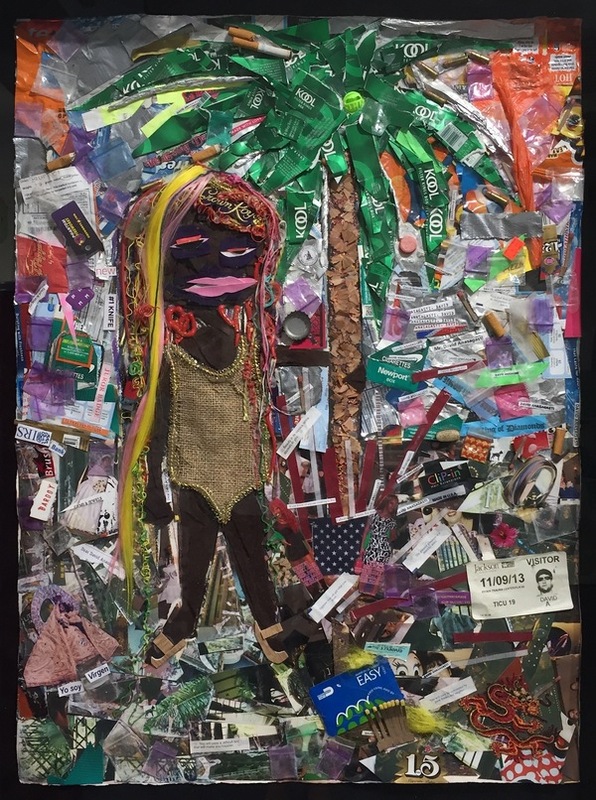 Tropical Depression in Paradise is made of collaged elements of cloth, felt, thread, wood, a Crown Royal sack, Kool cigarettes, and even beard hair, to name a few. With his recent success, his work can sometimes become glamorized. While the whole time, Ahol maintains that his work is the exact opposite of glamor. He has always tried to show the darker, grittier, real side of life in Miami, not the Miami that outsiders know of, sunshine, beaches, palm trees, bronzed women in bikinis at the clubs in South Beach. The central figure is his well known figure of an atypical, typical person standing on the street, perhaps Biscayne Boulevard. Looking closely at her, one can see she is created with many different unique elements, from her weave of thread to her face of a Crown Royal sack, wearing a body suit of jute, and gold trim, down to the wood veneer chancletas, (and if you look real closely at her, you can even see part of Ahol’s beard). She is standing next to a beautiful, most creative version of a Miami Palm tree constructed of Kool cigarette packages, and pencil sharpening for a trunk. It is the background of this work, that allows the viewer to get a true sense of the artist, and the real city that he calls home, Miami. Filled with cigarettes, Taco Bell packets of hot sauce, cocaine baggies, pills, and Chinese fortunes, intertwined with spliced collaged photos of random people, palm trees, la Virgen de la Caridad de Cobre, his bus pass and jury duty notices, we see how the artists lives, and shows off the city that he loves. You will see something different every time that you look at it. Posted on January 9, 2017 by admin in - WOW! 45 x 71 1/2 in. For some years now, the streets of Miami have been covered with enormous posters bearing the CLANDESTINE CULTURE hallmark. They are works that stand out not only because of the anti-establishment message implicit in them, but also due to their artistic quality. CLANDESTINE CULTURE is an American contemporary artist working in Miami who, despite his fame, has maintained anonymity. CLANDESTINE CULTURE was born in 1970 and moved to Miami in the early 1990’s. By the year 2000 he started working as a urban artist and in 2012 he had his first solo gallery exhibition. His work acts as visual cultural criticism and commentary, with established social and political agendas serving as targets for a unique style of illustration made using several different media, such us canvas, neon and banners. His art production is s diversified in different formats from painting and sculpture to street art installations and it is often characterized by large format works on paper, that use wheatpaste applications on urban buildings. The works have CLANDESTINE CULTURE written within the work. Known it for his strong social criticism and portrayal of taboo subjects, that sometimes can appear disturbing, no one can deny the controversial characteristics of his work. On July 20, 2013, one of his most important projects, The Banner Project, started. The concept of the project was to raise or hang flags around the city of Miami as art installations. The first flag was raised illegally over Julia Tuttle Causeway on a street light, property of the State Of Florida. The size of the banner was 10 x 16 feet, made of synthetic fabric and painted with latex paint, featuring a black and white image of a police in riot gear, with a red CLANDESTINE CULTURE sign painted at the bottom. This flag was raised on a High-mast lighting, at a height of 98 feet. The method used to raise the flag has never been revealed. The waving flag remained for five days, until it was removed by the Florida Highway Patrol. The flag on Julia Tattle Causeway, Miami – July 20th, 2013. By the summer of 2014 another The Banner Project took place, this time in the Miami Marine Stadium. The size and materials were similar to the one used on the Julia Tuttle Causeway. Approaching December of the same year, Culture acted again, on this occasion in front of the Miami Beach Convention Center, during Art Basel Miami Beach 2014. Since then no other flag has been placed in the area of Miami. Many other “street pranks” have occurred. For example, during the NBA Finals in 2013 Miami Heat vs San Antonio Spurs, CLANDESTINE CULTURE placed a sign that read “CITY HALL” and has arrows pointing to the sewer in the street. As for the name, the artist explains: “When I first wrote this phrase on the street six years ago, it was very personal, I was not happy with my life and the way society treated me. It seemed as if ‘they’ thought they were right and I was wrong. ‘They’ always told the truth and you had to obey them. ‘They’ never asked how do you feel, or if you agree with what ‘they’ are suggesting. ‘They’ are always correcting you. One night I was walking on the street by a commercial area close to my neighborhood. I passed by a big garbage container. I stopped, and with an oil stick I wrote, “I’M CLANDESTINE CULTURE. WELCOME TO MY WORLD.” I did not know why I did it, I just did it and it worked. I was feeling better after that. I released all my anger and all my frustration in just one phrase: CLANDESTINE CULTURE“. Still today, the artist chooses to remain anonymous. He hits the street with his face and head completely covered. He believes that the painting and the message is more important then the artist. He uses the faces of everyday people, images and words, to show that in the end, we the people are all part of one world wide culture… a clandestine culture. Posted on December 26, 2016 by admin in - WOW! His satirical street art and subversive epigrams combine dark humor with graffiti executed in a very personal and distinctive stenciling technique. It is thought that Banksy started as a freehand graffiti artist in 1990 – 1994 as a member of Bristol’s DryBreadZ Crew (DBZ). Banksy has always said that one of his main sources of inspiration is 3D. As all Banksy fans know, the artist can be extremely edgy, political, satirical, and in the case of this work of the week, Chocolate Donut, humorous as well. This work, Donut (Chocolate), needs no explanation. It is simply a spoof on the stereotype that American policemen are infatuated with donuts. Again, another perfect example of how Banksy’s work can be thought-provoking, intense, shocking, intriguing and humorous. In 2014, Banksy was regarded as a British cultural icon, with young adults from abroad naming the artist among a group of people that they most associated with UK culture, which included William Shakespeare, Queen Elizabeth II, David Beckham, The Beatles, and Elton John. His works of political and social commentary have been featured on streets, walls, and bridges of cities throughout the world. As of today, his work can be found in countless cities, from Vienna to San Francisco, Barcelona to Paris and Detroit. It is thought that Banksy currently lives and works in England. His last “face-to-monkey mask” interview took place in 2003.